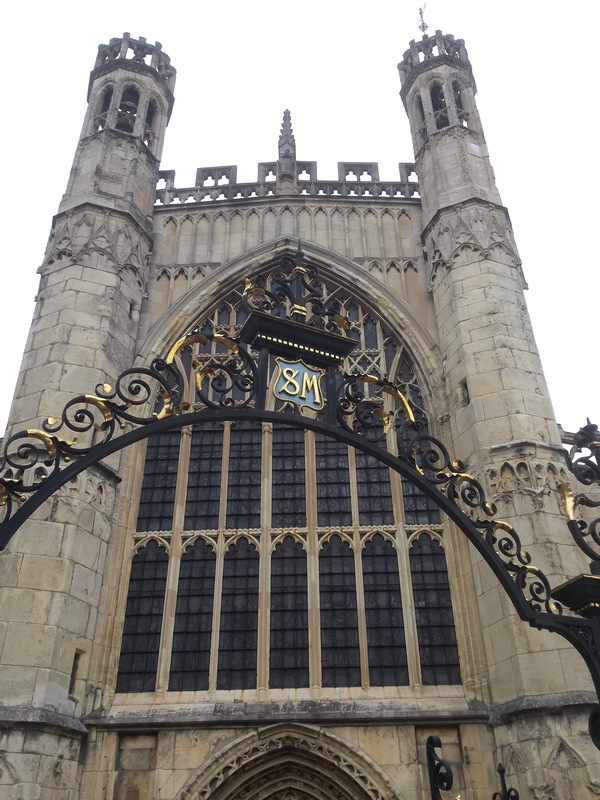 I do like Beverley – it’s your classic East Yorkshire market town, not as posh as Malton in the foodie stakes but with some lovely cafés and restaurants and particularly characterful pubs. The town’s Great Charter was granted in 1359, when it was perhaps the tenth-largest town in England (or at least one of the twelve largest, depending on your source), due to the wool trade, what else – it had a complicated system of self-government, with two Keepers or aldermen chosen each year from a court of eighteen, but reverted in 1573 to a more normal mayor and corporation system. It also boasts not one but two fine churches that would be larger and grander than many towns’ parish churches. There’s the Minster, of course, almost a mini-cathedral built between 1220 and 1425, which has no fewer than three chapels dedicated to the fallen members of the East Yorkshire Regiment as well as plenty of other military memorials dotted around the church. There are also fine fourteenth-century stone carvings of musicians in the north aisle and 68 misericord seats in the choir (more than any other church in England, and some very amusing), dating from 1520; near the altar is a rough stone seat dating from the eighth century, which might have been a bishop’s throne. At the other end of the town centre is the equally striking St Mary’s church, which was built in no fewer than fifteen phases between 1120 and about 1524 (although flying buttresses had to be added by Augustus Pugin and his son in 1853 to keep the south porch in place). In the northeastern corner is St Michael’s chapel, a Gothic masterpiece dating from 1325-45 (with priest’s rooms above), where you’ll see a carving of a rabbit dressed as a pilgrim which is said to be the origin of Tenniel’s White Rabbit illustration for Alice’s Adventures in Wonderland. 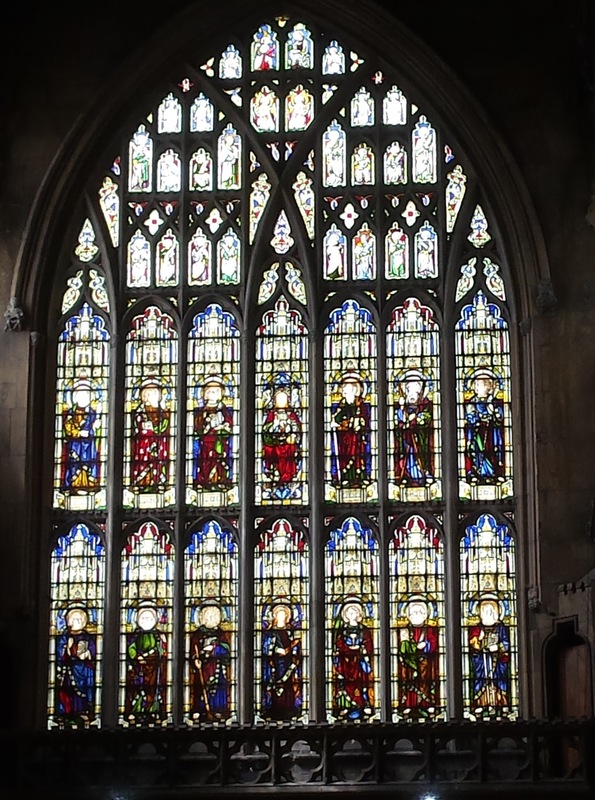 The great west window, dating from the late fourteenth/early fifteenth century, is supposedly reminiscent of that of King’s College, Cambridge, where of course I occasionally go to concerts or evensong – but it’s a little-known fact that the west window of King’s actually dates only from 1879. Interestingly, in 1188 the town and the Minster were hit by a disastrous fire, and sometime soon after 1213 the Minster’s central tower collapsed (and was rebuilt by 1270); likewise in 1520 the central tower of St Mary’s collapsed (and was rebuilt by 1530). The town’s other historical building that’s worth a visit is the Guildhall, now the local history museum – bought by the town in 1501, it was rebuilt in 1762 to create a courtroom with a lovely stucco ceiling by Giuseppe Cortese, and the present facade was added in 1832 – medieval timbers were revealed at one end of the courtroom when it was refurbished in the 1980s. You should also find your way to The Treasure House, a modern combined library and museum incorporating a bit of tourist information, a tower with views over the town, and a bridge to the Art Gallery, which proudly displays paintings by Fred Elwell (1870-1958), a well-loved Beverley artist whose depictions of local scenes are definitely worth a look. This area has lots of other fine large churches, due to the wealth of wool produced here in medieval times – by chance, cycling towards the Roman road out of the seaside resort of Bridlington, I came across Bridlington Priory, which used to be absolutely immense and is still huge, even with only its west end standing. Founded in 1113, it was dissolved in 1537 and stripped of its treasures for the king; the central tower transepts and chancel were demolished (with some of the stone used to repair the town’s harbour) – the west towers were added only in 1874 to give the church its present more balanced appearance. The much-loved Prior John died of the plague in 1379 and was canonised in 1401 as St John of Bridlington – he is easily confused with the more famous St John of Beverley, Bishop of York, who retired to a small hermitage near his birthplace and died there in 721. To add to the confusion, there’s also St John Fisher, born in Beverley in 1469 and executed by Henry VIII in 1535 for upholding the Roman Catholic doctrine of papal supremacy and refusing to accept the King as Supreme Head of the Church of England. From Beverley it’s an easy hour’s cycle ride down to Hull, which I wrote about in the run-up to its stint as Britain’s City of Culture – that went very well, and delivered many good results for the city. The Ferens Gallery is looking great, and although they insist it was nothing to do with the City of Culture, Holy Trinity Church (built c.1300) has had a thorough refurb and was promoted to Minster status in May 2017 – happily, it can still claim to be the largest parish church by area in Britain. Thanks to regeneration funding, it now has mod cons such as underfloor heating, so events such as beer festivals are being held in this rather amazing space! 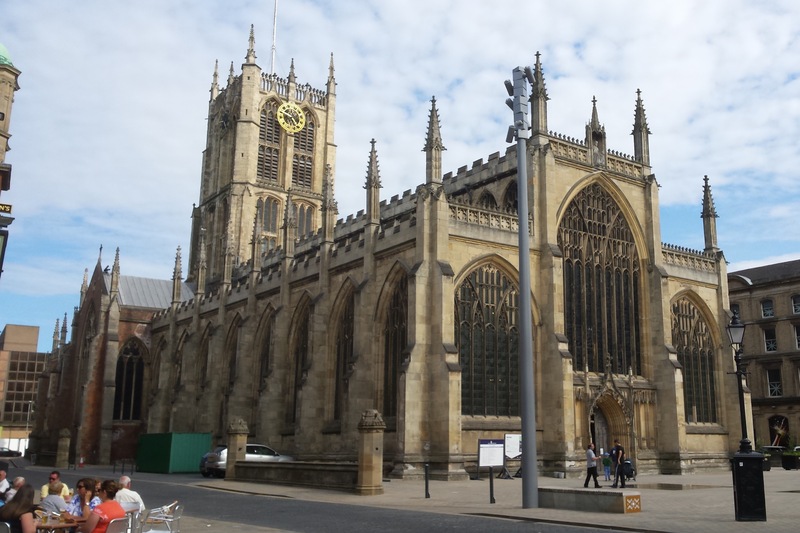 I also cycled past Selby Abbey but couldn’t get in due to a wedding – oddly enough, its central tower also collapsed, in 1690, and was rebuilt. 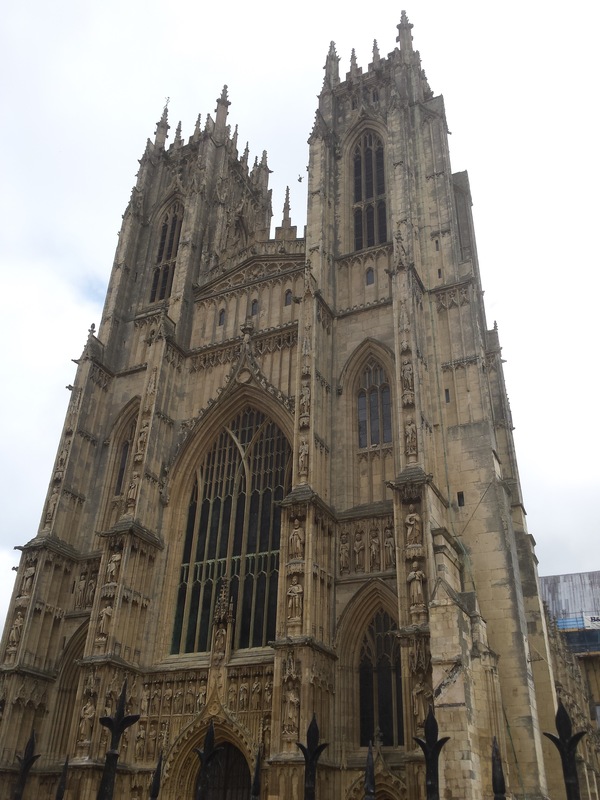 And of course there’s the amazing York Minster, the grandest cathedral in northern England, where my ‘god-brother’ (my mother’s godson) sings in the choir – I’ve briefly mentioned York before but will try to get around to a full post at some point. It’s also worth mentioning, especially for those of you with kids, that most of these churches house oak furniture by Robert ‘Mouseman’ Thompson (1876–1955), who developed a trademark of carving a small mouse (obviously) on most of his work. Beverley’s pubs should really be listed above with the town’s historic buildings – no fewer than 17 of them are Grade II-listed, and the White Horse (universally known as Nellie’s) is a wonderful period piece with its gas lighting and wonky floors (no, you’re not that drunk) – a seventeenth-century coaching inn, it was enlarged in the mid-nineteenth century, and owned by Samuel Smiths since 1976, so of course their standard bitter costs just £2 a pint! From a beer-drinker’s perspective, the most interesting are The Chequers, Yorkshire’s first micropub (so no lager, no spirits, just interesting beers from small mainly local brewers) and the Monk’s Walk, another seventeenth-century inn that stresses its old-fashioned no-TV-no-canned-music credentials, but there are plenty of others – the Sun Inn claims to be the oldest in town, closely followed by the Lord Nelson, while the Cornerhouse is worth a visit as a Black Sheep pub. At the upper end of the scale, the Beverley Arms Hotel has been bought by the Daniel Thwaites brewery and refurbished, and reopened in July 2018 – in the 1770s Mary Wollstonecraft was taught in a house on this site, and in 1868 Anthony Trollope based himself here for a parliamentary election in 1868 (annulled due to corruption, as expected – in this notoriously corrupt constituency, all the Liberals could hope for was to push the Conservatives to more outrageous bribery than usual and then expose this, but in this case the borough was actually disenfranchised) – his novel Ralph the Heir was based on his unhappy experience here. On the transport front, I was impressed by the rail service – there are generally two trains a hour from Hull to Bridlington (via Beverley), some to/from places such as Sheffield. However there’s a thinner service on from Bridlington to Scarborough – with the development of an hourly TransPennine axis from Liverpool to Scarborough (via Manchester, Leeds and York), the line south from Scarborough has become something of a poor relation. There’s also a daily train from Beverley to London and back. 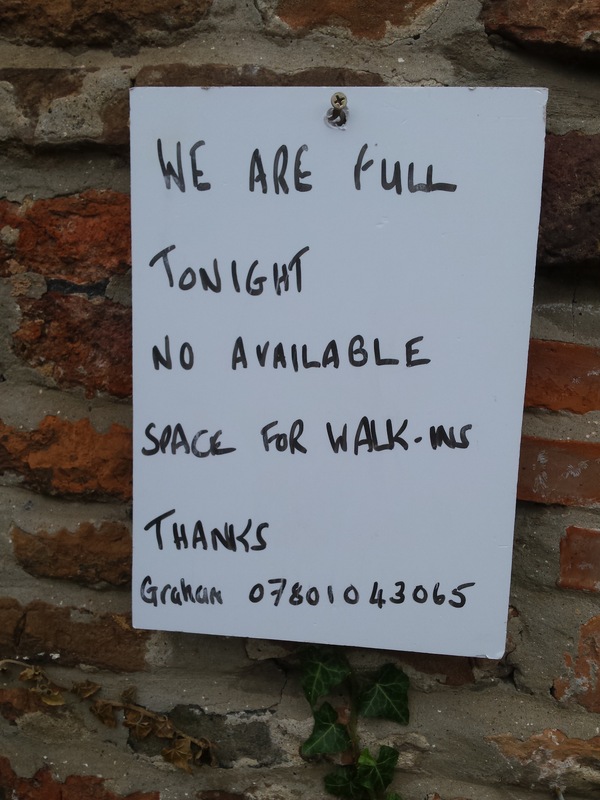 Finally, I’ve posted before about the disfunctional Youth Hostels Association – I stayed at the delightful Beverley Friary hostel, where the notice below was posted outside the front door. It was totally false, there were plenty of beds, what they didn’t have was a volunteer warden. 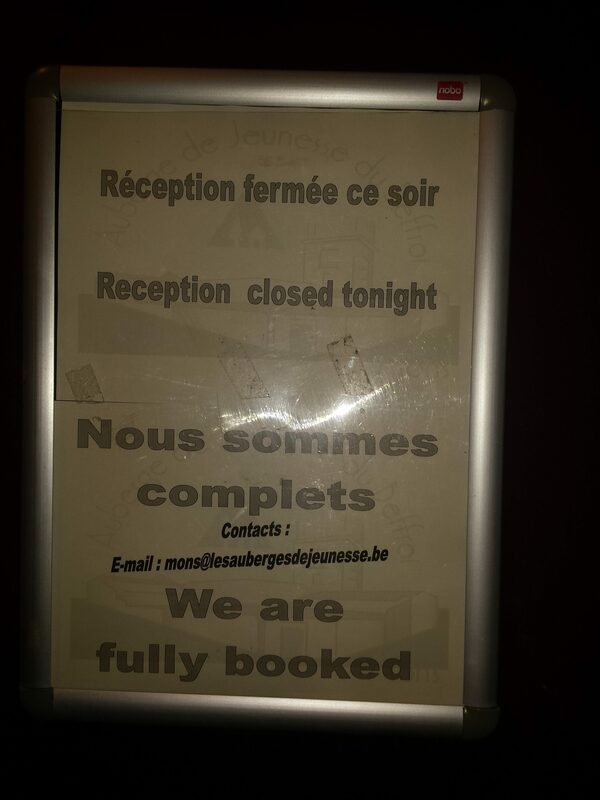 There were two members of staff who could check in the few of us who had booked well in advance, but no more than that. Their wages were certainly not covered by what we paid, so no wonder the YHA is in trouble. PS I now know that the same thing happens in Belgium, where the staff at the Mons youth hostel cleared off at 20.45, although there were definitely still beds available.